It's almost Valentine's Day! I am excited that I actually get to spend Valentine's Day with my hubby this year, and it's definitely got me in a 'lovey' mood. I'm not usually super big into Valentine's Day. My hubby and I don't normally make a big deal over it, but this year, for some reason, I am just feelin' the love, and want to let it show! If you haven't noticed, I sort of love fashion. I love high fashion, but it's not really practical for my lifestyle as a parent. I love boutique fashion, because because there are so many adorable, fashionable pieces of clothing for women that are easy to wear and move in, while still being trendy and affordable. I wanted to wear something cute and festive, with a Valentine's Day feel, in the days leading up to the holiday- but I also wanted whatever I chose to be something that could be worn anytime. Versatility is always a good thing (channeling my inner Martha Stewart, there). I was thrilled for the opportunity to work with Hang It Up Boutique, and share about their wonderful apparel and accessories. Hang It Up Boutique is an online fashion boutique, which caters to women who are looking for chic, classy, trendy, affordable fashion. My small city is pretty limited when it comes to places to shop for clothing. There are a couple of local boutiques with major boutique price tags. Hang It Up Boutique gives gals everywhere the opportunity to enjoy boutique fashion that's always up to date with the latest fashion trends (new inventory is added weekly), without emptying their pockets completely. I enjoyed browsing the endless apparel and accessory options available from Hang It Up Boutique. They have a fantastic collection of Valentine's Day apparel, and I selected a pretty little number that I fell in love with when I saw it. Within a couple of days of making my initial selection, this pretty package from Hang It Up Boutique was at my door! 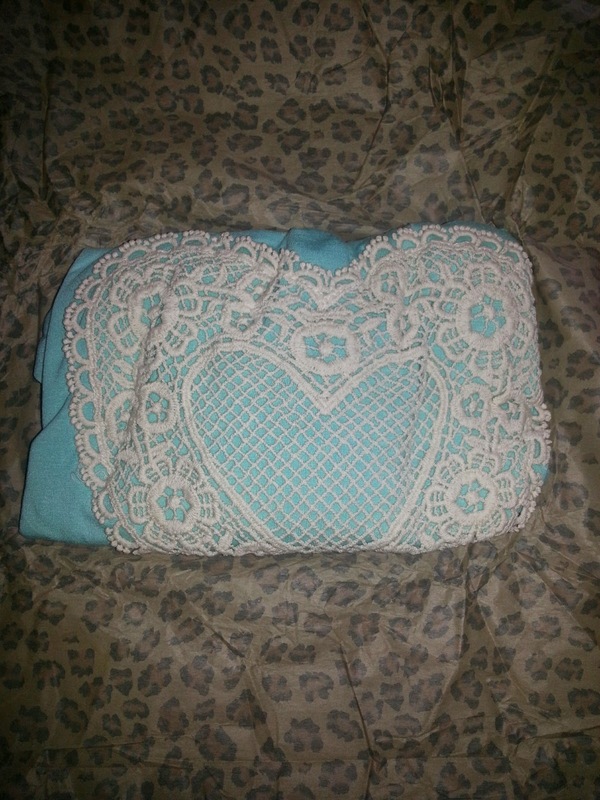 I opened up my package to find this sweetly colored mint tunic, with crocheted heart shape applique on the front. A few quick notes- I love tunics. I mean, tunics can be worn as dresses, if they're long enough, but they can also be worn with leggings or jeans. There isn't a (fashionable) shoe or boot out there that doesn't look good with a tunic (okay- maybe work boots... yeah, let's avoid work boots with tunics). Pair a tunic with tights and booties, leggings and flats or boots, or with nothing (ahem- if it's long enough), and a pair of sandals. Having a couple of basic tunics that you can dress up or down, and can transition through different seasons is a must. I went with the mint color for this particular tunic (also available in pink), mainly because I don't have mint colored anything. Mint is a great color to have in your closet right now- it's a beautiful transitional color from winter into spring, which you can match up with your whites, nudes, and play up with other colors through accessories. Lace and crochet are super trendy right now. These elements came back onto the scene last year, and the trend isn't going anywhere anytime soon. 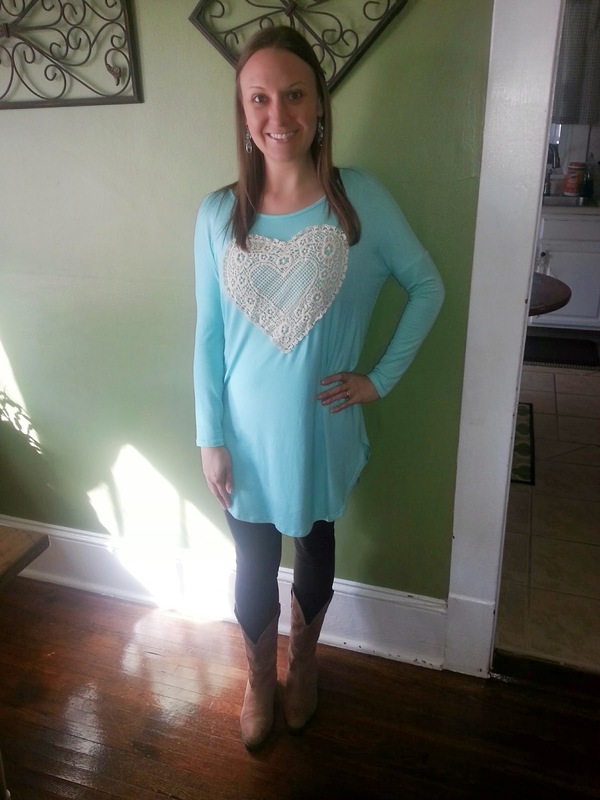 I paired the Heart Patch Tunic Dress in mint (size Small) with black leggings from Forever 21, Rampage cowgirl boots, and jewelry by Premier Jewelry. The size small was a great choice for me, as this tunic is fitted through the arms/sleeves, with a sort of dolman style under the arms. The body of the tunic dress is loose-fitting, as most tunics are. I usually fall somewhere between a size 2/4, and felt that I had plenty of room in this tunic. I loved the way it draped, being sort of angled toward the bottom. The length of this tunic is one of my favorite things about it. I wore this on a day that my son was home with me all day. I felt comfortable working at home, and just being mommy, playing with my little man in this tunic all day long. My hubby loves this tunic, and couldn't stop commenting how 'cute' it was. He really loved the color, and appreciated the trendy look, combined with modesty. I received a lot of compliments on this tunic- the style, the color, and of course, everyone I talked to about this tunic loved the crocheted heart patch- so adorable, and truly perfect for Valentine's Day. I took to Instagram with this photo, and got lots of love. 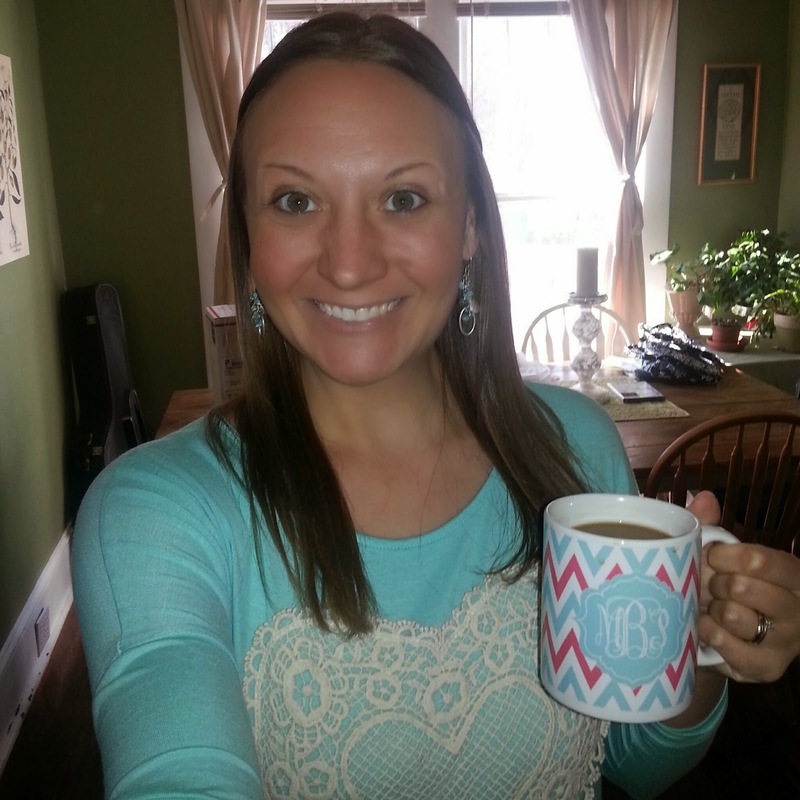 Plus, this tunic totally matches my favorite MBP mug, which makes it all the more lovable! I'll look forward to wearing this tunic again for Valentine's Day weekend. It's just really cute and fun, and would be perfect to wear for a special date, a day out with the kids, to show your festive side at work, or at home, etc. This tunic is lightweight, so I'll be able to wear it many more times through spring, before it gets too warm (we sometimes go straight from winter to summer in North Carolina!). I'll look forward to pairing this tunic with some cute coral or white colored leggings in a few weeks! I can't wait! Hang It Up Boutique has some beautiful Valentine's Day attire, as well as lots of other great pieces to take you from winter into spring. I can't wait to add even more great boutique style fashion pieces to my spring and summer wardrobe from Hang It Up Boutique! If you're looking for trendy boutique fashion that won't break the bank, Hang It Up Boutique is the place for you! 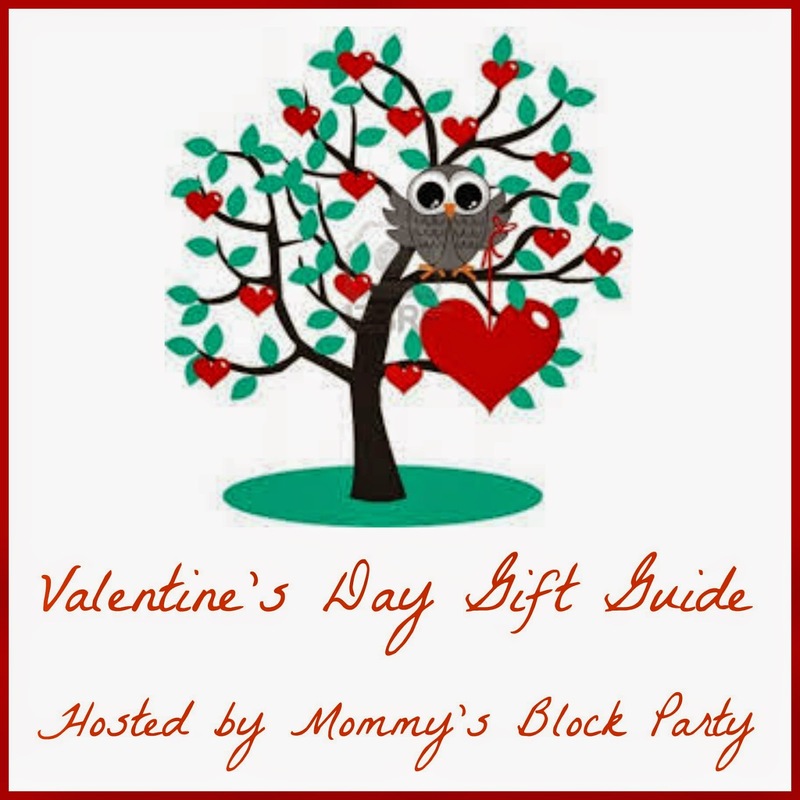 Don't forget- follow Mommy's Block Party on Instagram to get a sneek peek at fashion posts and upcoming features! Want this look? Get it! Head on over to Hang It Up Boutique and browse their latest boutique attire and accessories by category. Check back weekly for new arrivals. Hang It Up always has awesome sale items available, plus shoes, jewelry, and more! Be sure to connect with Hang It Up Boutique on Facebook, Pinterest, and Instagram, so you never miss out on updates and new arrivals! 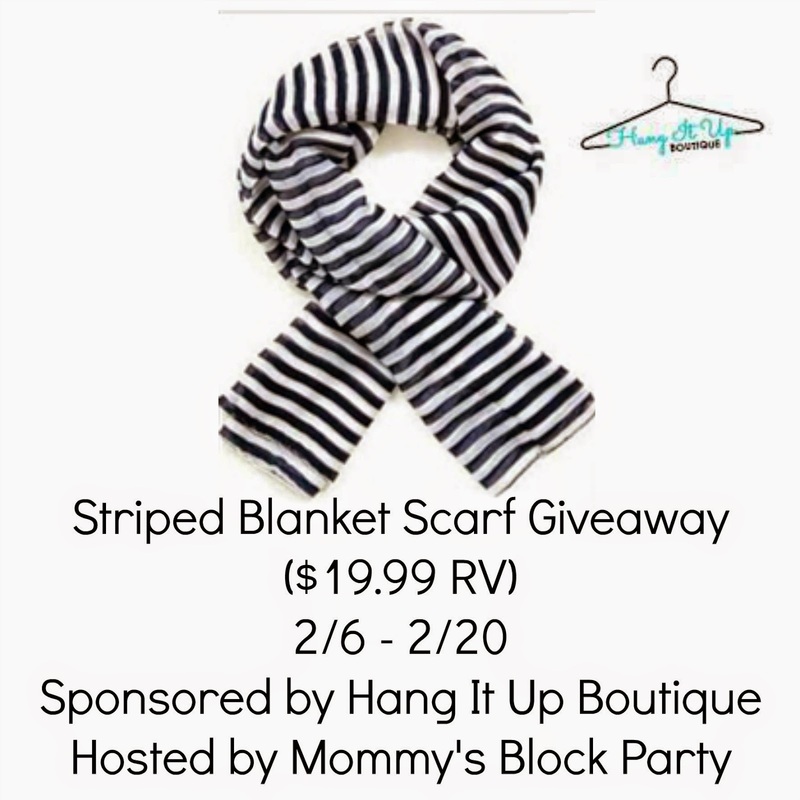 One lucky reader will win a beautiful Black and White Striped Blanket Scarf ($19.99 RV) from Hang It Up Boutique. We still have six more weeks of winter, so why not style up, while you bundle up? This giveaway is open to US residents, 18 and older. Just use the handy RC entry form below to enter for your chance to win! This blog is not responsible for prize fulfillment. Winner will be notified by the MBP team, and will then have 48 hours to claim their prize. Special thanks to Jacey of Hang It Up Boutique for allowing me to review and share about their beautiful fashions, and for offering this stylish giveaway for our beautiful readers! The FRENCH-TERRY-TUNIC-WITH-LACE-A is what I would pick! I think it'd look great with the Long Sleeve Maxi Dress (black). I think it would look great with the Basic Round Neck Long Sleeve shirt and a pair of jeans.